The rapper filed a lawsuit, and the Bitcoin wannabes folded. Or did they? Alas, poor Coinye, a fellow of infinite jest, has proved vulnerable to lawsuits. The Bitcoin wannabe was hit with a 124-page suit courtesy of Kanye, whose image it had tried to usurp. 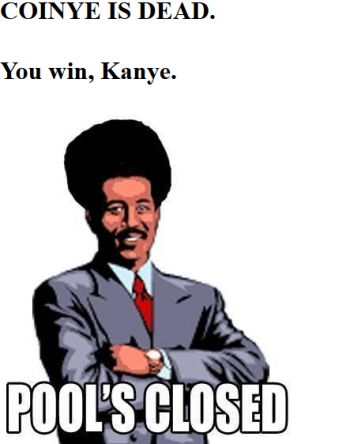 That would seem to be the end for Coinye, whose website now shows just one melancholy message: you win, Kanye. Pool's closed. The lawsuit targets 0daycoins.com, coinye-exchange.com, newchg.com, "Jane Does 1 through 50," "John Does 1 through 50," "Fnu Lnu a/k/a Jonny Bravo," Dogecoin, and Amazon - Amazon because that's where the Coinye site's hosted, Dogecoin because Kanye's lawyers believe it hosts Coinye trading websites - and accuses them of "wilful trademark infringement, unfair competition, dilution, and rights of publicity violations among a score of other blatant statutory and common law violations." Kanye's particularly upset that Coinye usurped his name and likeness, and that the defendants "cowardly remained anonymous." There's no way that anyone can look at Coinye and not think Kanye, the rapper alleges, since practically every news article about the cryptocurrency has mentioned Kanye's name, or displayed a photo of him. "With every day that passes," the lawsuit alleges, "Mr West's reputation is irreparably harmed by the continued use of the COINYE WEST, COINYE and/or COYE marks in connection with the Defendant's goods and services. Defendants have admittedly and wilfully infringed upon the KANYE WEST mark and consumers are likely to mistakenly believe that Mr. West is the source of these digital coins." 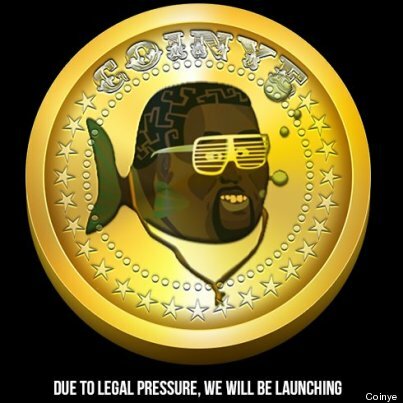 Kanye seeks triple damages because of the "willful nature" of the infringing acts, as well as all profits from Coinye. In response, the Coinye creators appear to have fled into the digital night. However it's possible the coin may revive in some other form. The originators appear to have passed their stuff - the Twitter feed, website and other digital assets - on to other Bitcoin hopefuls, some of whom seem to want to carry on the fight. "We are trying to avoid any lawsuit," says one of the alleged not-Coinye organizers. "And we are not US-based. So they'd have to go through inter land laws." No one man should have all this power! I love Kanye, he has the best attitude, he needs to do a song with Charlie Sheen. It would be called "I'm the greatest (I have a hot wife.)" This reminds me of the chinese government saying Battlefield made them look bad, does't this gay fish hurt his own reputation enough? Ah, but if we wait, the Kanye West will soon find something else to complain about, and all is right with the world. I think this is the first use of Habbo Hotel that I've seen in five years...not sure how I feel about this. Mr. West, welcome to the internet, where anyone's image that is uploaded to it will have been altered millions of times to have anything from a cartoon fish look or several giant demon phalli surrounding it and can be plastered anywhere. You may be able to sue these guys because they were technically trying to create a profit, although the damage now may be worse than just letting them make (possibly) a little cash with your vague likeness, since groups like 4chan love this kind of news. Have fun finding out that several top hits of your name on Google will lead to pictures of valiant knights slaying a giant suggestively shaped monster with your face or some other hilarious NSFW picture. This is pretty obvious, but Kanye didn't need Coinye to hurt his image. I hope Coinye is picked back up by someone else. Funny thing is, if he would have just kept his trap shut, everything would have blown over in a day or two. Now all he does is what he claims to prevent, setting himself in a bad light. And we are not US-based. So they'd have to go through inter land laws. These guys sound like they know their international law inside out. But seriously, dunno how I feel about this, it was obviously just a harmless joke and not an attempt to hijack his image for worse, still I can understand not wanting to be tied to an unrelated product who could well be embroiled in future scandal for all you know. That man just can't take a good joke. Okay, this was a stupid idea anyway - just like cryptocurrency in general. I don't like Kanye or anything, but if he didn't take it down, the whole thing would have just crashed and burned. All the news about Coinye mention him, so he's right? I like how people act as though using someones likeness for the express purpose of making a profit without asking for permission is somehow alright. Kayne was in the right here, not that anyone here will accept that. And somehow, it'll involve him comparing himself to Jesus. It did prove that he is indeed a gay fish. I mean, they changed the logo of their currency into a fish and he still claimed it stole his likeness. This of course means that we can continue with all the jokes a thousand fold that always made Kanye cry. Hey look, it's the Streisand Effect. his persona as a rapper has been irreversibly connected with having lots or even being made of money! Mr West's reputation is irreparably ruined! That's just it with celebrities, it goes beyond first world problems. It's like 0st world problems, where they live in a world of such chaos, constant monitoring and image that the range of what they consider "problems" is a black hole of banality, inescapable, infinitely stretching towards complete neurological decay. As a result, I'm not going to acknowledge Kanye West's passing when it happens. Steve Jobs' death meant more to me in hindsight. There's no way that anyone can look at Coinye and not think Kanye, the rapper alleges, since practically every news article about the cryptocurrency has mentioned Kanye's name, or displayed a photo of him. Practically every news article I've seen has been about the C&D or the lawsuit. Hard to write those without bringing his name up. I doubt the creators expected it to do otherwise. My guess is the only reason they briefly attempted to fight the lawsuit was because they knew it would make Kanye West look even more ridiculous. These laws are in place for a good reason, even if you yourself don't care. Quit it, guys. Never watch anything on E! (excluding the Soup and/or Chelsea Lately, which make fun of people like Kanye) or MTV. You'll probably want to kill the nearest living thing after five minutes. cowardly remained anonymous? No a coward sends an army of lawyers because you don't like a parody of yourself to be used on the internet. Yup, because as we all know we have to submit to the all knowing benevolent RIAA and MPAA lobby group laws, lest we descend into a state of 100% piracy. After all, why it's not fair that these celebrities are the only victims of these horrendously offensive things such as "parody" and "satire". It is a much better idea to just remove them from legal protection along with reviews so there won't be good products out there with all bad reviews due to the abundance of hateful consumers on the internet and in newspapers! Come to think of it, I should be glad that I'm not being sued right now. After all, my name is Lowell, and I'm clearly negatively affecting the image of the store Lowe's brand, due to my lack of a selection of tools and store coverage. It must be true as well, considering many times when my name is brought up, people mention Lowe's. I should go into hiding, considering I was fortunate enough to be born in the land of the free! Kanye, I'm happy for you, and Imma let you finish, but coinye is one of the best digital currencies of all time. Seriously though dude, it's not a big deal. It's not parody or satire, it's yanking someone's image and appearance for personal (monetary) gain. You know... lazy greed. Again, Coinye was ripping off Southpark, not Kanye. Kanye isn't in a competitive market so this would just be parody where he is concerned. Southpark, however, they'd have a case. Bitcoin may have had a better case too. Had Coinye really taken off legitimately then Kanye would have had a likeness case. But this seems like mostly a joke from the beginning. What is the most hilarious part about this is that Kanye is actually acting like the South Park charicature of himself. He must not be a "gay fish". Let me know if that's not actually a legitimate SouthPark site. It looks like the real deal. No, that's what rich people do. Cowards stay hidden or hide while doing their dirty work. Yeah, like I said, I don't think something like this is satire or parody in any way. He would have to be an idiot who would have to be way too obsessed with money and appearing masculine for this to be satirical in anyway, which it's clearly not. It looks exactly like Mr. West, seeing as they clearly used an unaltered image his face and his name. Idiots might tell you that beyond a passing use of the "YE" on the end of Coin which is exactly like Kanye West and not any other people with a similar name, but they're completely wrong.